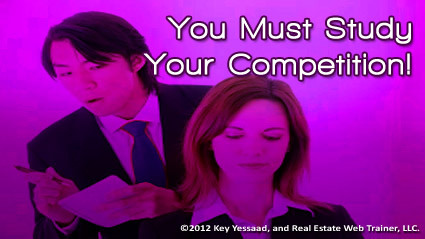 How do you prepare for 2013 if you are a Real Estate Broker or Agent, and plan to compete aggressively? Study your Competition! Real Estate is a Zero-Sum Business Endeavor, let me explain: there is a field of Mathematics named originally ‘Operational Research’ and has come to be labeled ‘Game Theory’, a lousy name is you ask me – there nothing flimsy or playful about the Mathematics; in Game Theory a Zero-Sum Endeavor is one in which the gain of one party is balanced by the loss of the other parties – and Real Estate is such an endeavor. Each market has predictable number of Listings, and therefore potential Sales for the economic conditions and turnover of its population. When a new Real Estate company enters a market it is not creating new listings per se, it is necessarily taking them away from existing Real Estate Companies who have not prospected or marketed to those potential Sellers. It is the job of the broker to study the market reach and marketing depth of the competition in order to match and work around their weaknesses. If you desire to compete and thrive you must: Study your competition inventory and clientele; Study their local marketing; Assess their marketing Budget; Study their agents and stability; Study their community outreach and events; Study their leadership skills and effectiveness; Study their Global Internet SEO Placement; And Never, ever, dismiss or speak ill of them – their agents will soon become your colleagues.